Bowie during the Ziggy Stardust Tour. HELP! Does anyone know why a last leg of The Ziggy tour was canceled? I have an unused ticket stub from 9/22/1973 in Chicago at the Auditorium Theatre. Any info appreciated! 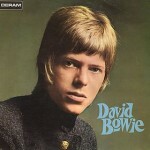 I saw Bowie for the 1st time in Phoenix, AZ in November of 1972. It was an absolutely amazing show with the Spider From Mars backing Bowie. No one had ever heard such a talent with such energy. The songs were incredible then, as they still are now. Unbelievable is a word used too many times, but Bowie was that and more. The crowd that was lucky enough to have been there was spell bound and went crazy for this man with such indisputable talent. Beyond this, I saw Bowie 3 more times. It was always a different show, with a different line-up, but David Bowie was always on his game with an undeniable connection to his audience and his songs. Good God – 155 shows around the world in 18 months, often with numerous back-to-back stretches of shows and even an 11-day stretch with a show each night. That had to be absolutely grueling considering how much energy these guys put into each performance. They were all superhuman. Then again – they were from Mars.